What time is it? Our HappyVirus Wall clock can be a time telling teacher for your children; It points directly to the numbers your child should read. It’s silent and non-ticking, and won’t interfere with background music or conversations, or interrupt your focus in a quiet space. Battery powered clock features slender hands and big bold numerals for children. This stylish clock will be the focal point in your room. Great as a living room wall clock, kid’s bedroom clock, kids’ classroom and more! Order yours today! You will not be disappointed. ★ [Easy to read & understand] The slender hands and unique face design always tell your child exactly which numbers to read. 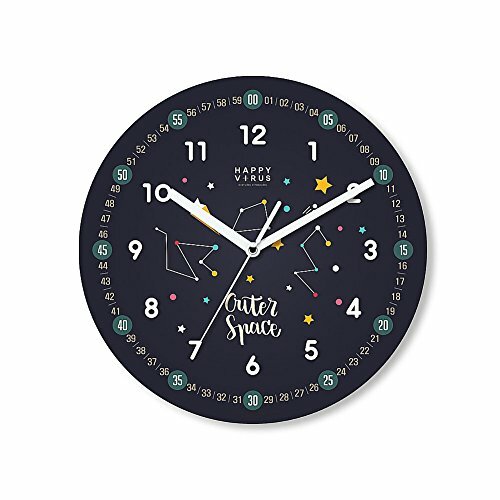 ★ [Cute design] This modern quartz clock can be placed in the ambiance be it kid's bedroom, living room, or even in kid's classroom! ★ [Quiet & Non-ticking] The silent Quartz Movement ensures no distraction in your room. ★ [Easy installation] The back of the clock has a slot for nail or screw ensuring hassle free installation. If you have any questions about this product by HappyVirus, contact us by completing and submitting the form below. If you are looking for a specif part number, please include it with your message.